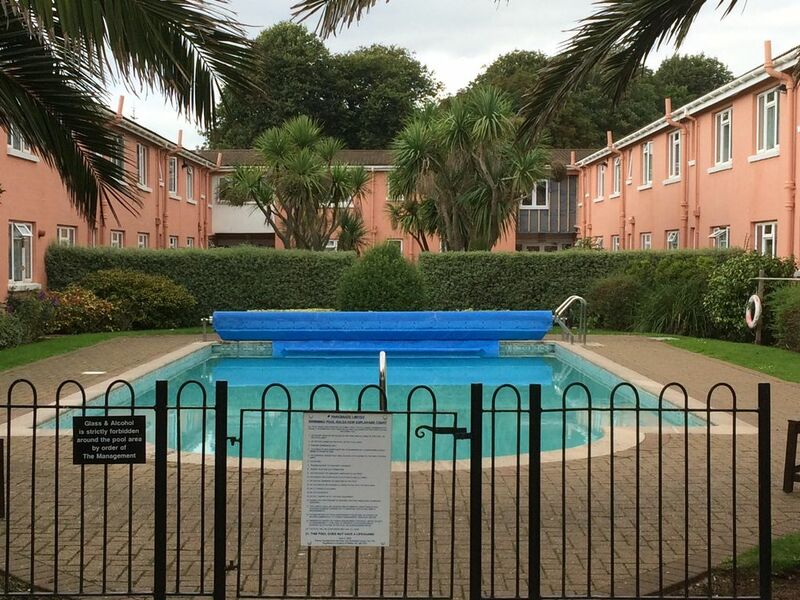 This is a one-bedroom apartment located on the first floor of New Esplanade Court, a two storey block of holiday apartments located opposite Paignton seafront. The apartments have a communal heated swimming pool (open from May - September) and garden area. Entrance to the apartments is through a lockable gate. It is located just behind sea front road so although right in the heart of the beach area it is in a quiet location. A range of books available. Please take with you any book you haven't finished! The swimming pool is open from May to September inclusive. Great property. Pool was fantastic. Close to everything and parking was ideal. Everything was on the door step and the kids had a great time in the pool. The apartment is in a awesome location, couldn't get much closer to the sea front. A lovely welcome from Richard and Lucy, strawberries, cream, biscuits, tea and coffee 😀 The kids loved the pool, nice and warm. So much to do in and around Paignton. My youngest loved it so much he cried when he woke up on the last morning! Apartment was in great location great pool bedroom was very spacious kitchen well equipped the bathroom could do with little updating but overall a lovely stay.Richard was absolutely great met us at apartment greeted with milk coffee tea and scones ,would definitely stay again. A nice clean flat with everything you require for a enjoyable holiday. On arrival Richard and Lucy were waiting for us, they were extremely friendly and very helpful,they took charge of the heavier cases for which we were very grateful. On the table waiting for us was a packet of jam and cream scones.a packet of biscuits,a litre of milk,tea bags and coffee,which we thought was a lovely touch. The flat has every thing you require for a enjoyable stay, the mattress on the bed was very comfortable. Susan and myself love flats and caravans to holiday in,they give you total freedom to come and go as you like,this is the second year running we have holidayed in Paignton,the same dates each time and we have had two glorious weeks of non stop sunshine. Thank you Richard and Lucy. Paignton is a popular seaside resort in Torbay, Devon, in the South West of England. The area is famous for its beautiful beaches and fantastic coastline. Paignton also has a mulitiscreen cinema, a world class zoo, outdoor water slides, and a steam railway. All of these are in easy walking distance of the apartment. Paignton Green, across the road from the apartment, is home to the Paignton Geo Play Park, a state of the art play facility for 2 -13 years, with free entry for all. Nearby Torquay has more beaches, the historic Torre Abbey, the prehistoric caves of Kents Cavern, the Living Coasts Marine Park, the famous Model Village and a lovely marina. Brixham, the other town in Torbay, is a picturesque fishing village. Both Torquay and Brixham can be reached in 15 minutes by car or bus. From Paignton you can also go to Dartmoor National Park, take a boat trip on the beautiful river Dart, stopping off at Totnes and Dartmouth, see the historic cities of Plymouth and Exeter, and visit Cornwall, just one hour away. Cancellation Policy £50 cancellation fee up to 30 days before start of booking. Between 7 days and 30 days 25% of total booking cost charged. Less than 7 days, 75% of total booking cost charged.